Futurama may be over, but its characters have at least one more TV story to tell. 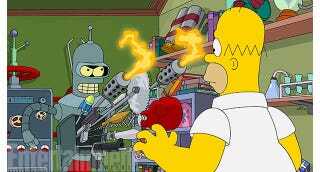 In the first image from the Futurama/Simpsons crossover episode, we see Bender as a time-traveling Terminator, sent back to kill Bart before the boy can cause a horrible catastrophe. The crossover—which features Futurama voicecast members Billy West, John DiMaggio, Katey Sagal, Lauren Tom, Phil LaMarr, Tress MacNeille, and Maurice LaMarche—will unspool a complex, Terminator-esque story that involves Bart blowing his nose on a sandwich that he places in a time capsule. When that mixes with Milhouse's rabbit's foot and some radioactive ooze, it creates a global catastrophe in the future, prompting Bender to travel back in time to kill Bart and prevent this mega-mess. So will we get to see Marge in badass Sarah Connor mode?